WHAT: Stone delivery (5 trucks) of ballast material at the layup yard. WHAT: Concrete delivery (15 trucks) for installation at the Service and Inspection Building Lanes, including a 31m Z boom truck.. WHEN: Tuesday and Wednesday between the hours of 3 a.m. to 6 a.m.
WHAT: Concrete delivery (8 trucks) for installation at the Service and Inspection Building Lanes, including a 36m boom truck. WHEN: Tuesday between the hours of 6 a.m. to 9 a.m.
WHAT: Restraining delivery (1 truck) to be installed in the yard lead track. WHEN: Tuesday between the hours of 7 a.m. to 1 p.m.
HOW: Trucks will travel from Allentown, PA, South on 15, East on 267, South on Rte 606/Old Ox Rd, and will have to turn around at Mercure Circle to make the right into the jobsite. WHAT: Precast Panel delivery (8 trucks) in 45 minute increments for installation at building TBD. WHEN: Monday - Friday between the hours of 7 a.m. to 2 p.m.
HOW: Trucks will travel from Winchester, VA, East on Rte 7, South on 28, and West along Rte 606/Old Ox Rd to the project site, making the U-turn at Mercure Circle to make the right into the jobsite. WHAT: Turnout delivery (2 - 3 trucks) for installation in the yard lead track. WHEN: Monday, Tuesday, and Friday between the hours of 7 a.m. to 12 p.m.
WHAT: Rebar delivery (1 truck) for installation in the Service and Inspection Building. 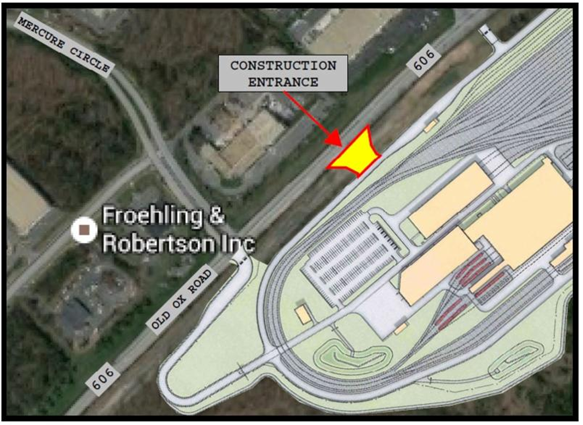 WHEN: Monday, Wednesday, and Friday between the hours of 6 a.m. to 10 a.m.
HOW: Trucks will travel from the Trowbridge plant, West on Rte 606/Old Ox Rd, and will have to turn around at Mercure Circle to make the right into the jobsite. WHAT: Rebar delivery (2 - 3 trucks) for installation in the Warehouse Building and TPSS Slab. WHEN: Tuesday between the hours of 6 a.m. to 10 a.m.
WHAT: Structural Steel Delivery (2 trucks) for installation in the Warehouse Building. WHEN: Wednesday - Friday between the hours of 6 a.m. to 12 p.m.
HOW: Trucks will be coming from Tennessee, traveling North on Rte 606/Old Ox Rd from US 50.